When we think of upper body functionality, the arms are the first thing that comes to our mind. That’s because the arm, located between the shoulder and elbow joints, is responsible for executing all imaginable movement patterns. That being said, it’s kind of fascinating that the forearm, which makes up 50% of the arm, is not a particularly popular body part to emphasize within a training program. This can be considered as somewhat irresponsible, because having strong forearms offers some major benefits in terms of upper body performance, since the forearm muscle is a flexor of the elbow joint responsible for movements such as bicep curls and it has the ability to put our arms in a supinated or pronated position during exercise. In fact, developing your forearm muscles can be the key to success in breaking through training plateaus and taking your performance to the next level. The fact that training your forearms will result with tremendous improvements in grip strength is almost a no-brainer, because when you perform movements that target the forearms, such as forearm curls, your wrists go through all possible ranges of motion and thus earn greater strength and stability. These gains are directly linked to a better performance of compound lifts such as the bench press, deadlift and all rowing variations, all of which demand a great deal of grip strength and are vital to any training program. And naturally, an improved performance translates to greater gains almost immediately. Besides its influence on athletic performance, the above mentioned grip improvement has its useful effect on your daily routines as well, since a great number of day-to-day activities depend on the grip and stabilization supplied by the forearm. Stronger forearms and more stable wrists will inevitably lead to easier and better execution of all motor activities of the arms and hands, such as gripping, pushing, pulling, writing, carrying stuff around and of course, jar opening. Perhaps the most important benefit of forearm training is its ability to reduce the risk of injury, which is critical for bodybuilding success. Adding exercises such as the wrist curl to your training routine can help you prevent both minor and severe upper body injuries by strengthening your wrist flexors and thereby enabling the wrists to withstand the stress they get placed under in most compound movements. This also means that having stronger forearms will help you hold more weight in your hands in a safe way and increase the overall effectiveness of your upper body training. Now that we’ve discussed the benefits of forearm training, the only remaining question is which specific exercise can help you take your forearm and wrist strength and condition to the next level. And the answer is: the barbell wrist curl. This exercise can be performed in a standing or seated position. Most lifters prefer the seated version, so to begin, sit upright on a bench with your arms resting on your thighs. Grip the barbell with a supinated grip (palms facing up) and hands placed at shoulder width apart. Place your feet flat on the floor, slightly wider than shoulder width apart, for maximum stability. Lean a bit forward and place your forearms on the top of your upper thighs. As you inhale, lower the bar as far as possible, maintaining a tight grip. As you exhale, flex your forearms and curl your wrist upwards and bring the bar up as high as possible. Only your wrists should move and all other parts of the arm should remain stationary. Hold the peak contraction for a second, then inhale and slowly release your wrists back to the starting position in a controlled manner. If you perform this portion of the movement in a careless way, you are at increased risk of spraining your wrist or causing other ligament injuries. If you weren’t born with a set of massive forearms, you’ll need to hit them hard with heavy weights and high-volume work on a regular basis. Include two forearm exercises in your bicep training day or train them on days when your focus is on lower body movements. In addition, since the forearms are used to performing low-intensity movements all throughout the day, you will have to ensure that your forearm workouts don’t lack the intensity and versatility required for optimal growth. Change your rep range every week in order to shock the muscle and prevent adaptation. Always opting for bilateral exercises could leave you with muscle imbalances where one forearm is stronger than the other or an unbalanced grip. On top of that, most people naturally have a more dominant arm, and bilateral exercises can further accentuate this discrepancy. 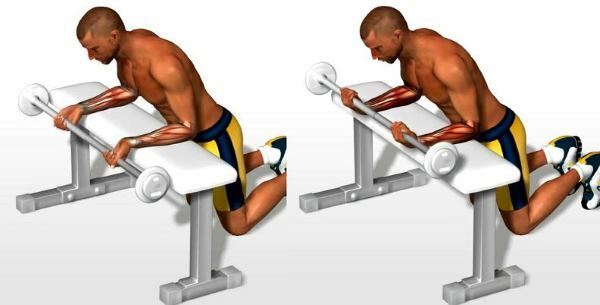 To avoid such asymmetry, emphasize unilateral forearm training with dumbbells to adequately isolate both forearms and make them perform an equal amount of work. You’ve probably noticed that the forearm curl has a very short range of motion. Because of this, it’s easy to rely on momentum or get away with poor form while performing the movement, which causes the range of motion to become even shorter, reduces the contraction and ultimately diminishes the effectiveness of the exercise. To prevent this from happening, focus on achieving maximal contraction instead of allowing momentum to do the work and chose a weight that will allow you to perform the full range of motion in a slow and controlled manner.